Changed out the spark plugs today. I have put a little over 40,000 on the Avalanche and not knowing how long before that they had been there. They looked nice clean but worn. The gap on all of the old ones was 65 to 70 thousandths with considerable metal transfer on most. Sure idles a lot smoother now. Put in new wires as well, went with the stock AC/Delco's. Saw no need to go to a performance wire. What should have been an hour job at the most. Turned into all day job. Went to replace the DRL sockets got the drivers side changed. When I went to install. It would not fit. Got my fat head up to see. There was a big glob on the housing it had melted. pulled in it was a good day to give blood. Got the housing out and was able to clean up the housing to make it work. The passenger side went to easy. I know it will have a meltdown when I install the LEDs. They should be here by Friday. 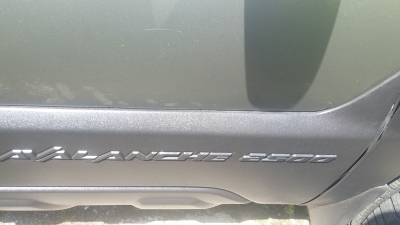 What did I do to my Avalanche today? Well, I purchased my 2002 Avalanche yesterday evening, so this is my first day to work out the bugs... of which there are many. Thankfully, they are more strange than difficult, for the most part, I just have to learn the vehicle. (I have a lot of history with Fords, almost none with Chevy). Today's adventures were in two different areas: Keys and front lights. The key problem is mundane, none of the physical keys I received operate the doors (one will not turn, the other not insert fully). This is gonna be new lock cylinders, and my aftermarket remote starter fob locks/unlocks fine. I still do not have a good count on the number of lock cylinders in this vehicle... I keep finding more and more! I followed my wife home from the car dealer, and when we got home she said there was an amber light on one side but not one on the other side. (I really should make this a riddle for you all, it's a funny one). But, she also said that it wasn't there all the time. I eventually got her pinned down to a light that shares a housing with the fog lights. I pulled the light from the driver's side, and it looked to be a standard amber parking/turn signal bulb 4157. And that made me sit down and think for a while. There is already functional parking/turn lights on top... and I have never ever seen a vehicle with 2 turn signals on each side. The previous owner kept the owners manual (Thank you!) and I eventually puzzled it down to Daytime Running Lights. As near as I can tell, the previous owner decided to install amber lights instead of clear. And, one of the lights did have a burned out filament, so it's all come together now. I replace both bulbs with clear 4157's and test... which isn't so easy, but I found the right set of conditions to make the bulbs actually come on... for me, one of the correct condition sets was: in daylight (duh), headlights on AUTO, engine running, trans in Drive. It may work in other sets of conditions, this worked for me. This is GOOD! I live in Northern MN, and I have the same kind of weather that caused Canada to mandate Daytime Running Lights. SOLVED! 5) Service Center blinked 'SERVICE 4WD' briefly after I tried out 4WD, does not show the message consistently. 6) There is a minor rough idle condition that I am trying to work through. It's not really noticeable unless you are looking at the engine, it's got a little wiggle going on, and a V8 shouldn't do that. 7) Oil/filter change (I'm a Mobile One / Baldwin guy). 8 ) Other fluids as time and money allow... I like to run synthetic throughout. 9) Figure out if there is a block heater, and if not, should I put one in. I need to poll the group here about cold-weather starting - plenty of sub-zero coming up. 10) No sound from rear speakers. Minor, I listen to the news for 10 minutes on the way to work. 11) All the front lamp housings are badly glazed, and one headlight housing has an internal shield bouncing around inside. I have yet to figure out this puzzle, apparently there are release tabs... I don't see them yet. The top housings have zip-ties on the top tabs for some reason. 12) I have yet to figure out if this is a 1500... well, it's a 1500 but it's high with 17" wheels, so I wonder if it is a de-decaled Z71... just curious, I might find the answer as I browse the forums this evening. So... yeah. I have some days off so now I have something to do. I did a lot on another vehicle club site, so I will most likely be long-term active here too. I'm not posting my buglist for specific comments... I suppose all of this has been covered repeatedly here, so I just need to keep searching. But, if you felt compelled to comment on anything I should be focused on for cold-weather ownership, or if you can point me to a thread on those headlight release tabs, that would be great. Nevermind on the headlights, I cut the zip-tie and discovered where someone had broken the tabs off, and then used a zip-tie to secure the turn signal housing. It's easy once you see what should actually be there. Speaking of oil analysis, Blackstone labs https://www.blackstone-labs.com/free-test-kits.php came highly recommended from the aviation industry. I've used them several times since I am a little paranoid about a tiny mysterious coolant leak. Good people. Significant additional peace-of-mind for $28 a shot. Please note: Since engines, oils, and histories vary so much, I'm told that oil analysis's real value is spotting changes over time. I had a mysterious coolant leak and was worried it was the heads. Turned out to be a pin hole in the water pump gasket. Changed the pump anyhow since it was off. to the club Roadrunner. It sounds like you may have bought an Avy that was owned by a member. The first mod we make is to replace the DRL's with Amber bulbs. Some then go in to do and all on mod where the DRL's, fogs and low beams stay on when you switch on the high beams. last night I bricked the ECM on the Dmaxalanche, trying a mild tune update. cussing and ranting it finally accepted a stock file...… Trying again today...…..
Did ya press the wrong button AA. Most of the stuff listed are common things as these trucks age. I'm pretty sure most people never even use their keys in the doors on these truck. I never did. Could be why there's issues. Some kind of lube in them may make them work. tow/haul probably has a broken wire in the steering column, sounds scary but an easy fix. minor rust that you can see may very well be major rust under the cladding. Count the lugs on the wheels. 6 lug is 1500, 8 is 2500. Also the 2500 have 2500 after the Avalanche on the side door panels. Pretty sure they have 16" wheels also on them. No.2 is a broken wire in the steering column. Also, in order to figure out exactly what options you have, there is a thread for RPO codes here http://www.chevyavalanchefanclub.com/cafcna/index.php?topic=84494.msg2138193#msg2138193. The RPO codes are located on a sticker in the glove box. As far as lock count, there should be six - both front doors, both saddle bags, tailgate and ignition. I think I remember owners of 2002 AVs mentioning that the center console had a small keyed lock that was separately keyed from doors and ignition. As far as the 17 inch wheels it could be a debadged Z71 but as mentioned above if you check your RPO codes you will find out. Otherwise an original owner may have upgraded from 16 inch rims to do the mod where some first gen AV owner upgraded their brakes to the larger second generation AV brakes. Thanks all, yeah, I went through the options sticker today... it's a de-badged Z71. (I don't think the dealer knew that!) Discovered it has a locking dif. I'm kind of anxious now for some snow to check everything out. The broken wire... I saw quite a few YouTubes on that, I'll get in there and splice it one day, purely out of the desire to have everything possible working. I rarely haul or tow. 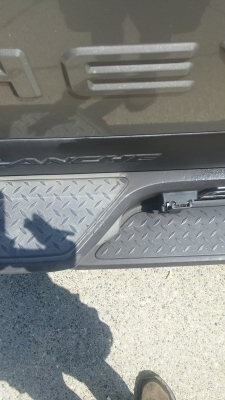 Today I fixed the lock on the tailgate. It was really stiff, like break something off stiff. I took the handle cover off and nailed everything with PB Blaster, fixed! The gas gauge goes down at an alarming rate... I knew that was going to be that way when I bought it. It broke twice on me, so I relocated it to the dash just right of the steering column; using a flat round chrome momentary button. Been working for years now. I've been a little busy lately but I found some time to do some maintence on the lower cladding. I haven't applied the Ultimate Black in over a year so you know how bad it looked. 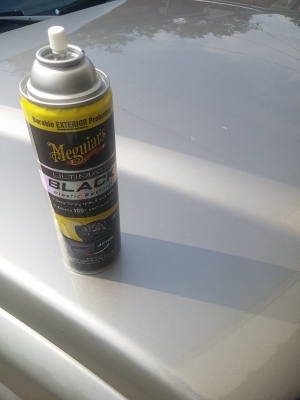 They make Ultimate Black in a rattle can now so applying it in the lettering is way easier now. Rattle can really, that's good to know. Yup I haven't seen it advertised yet, but it was right next to the bottle. And.... fixed. Pulled the wiring out, spliced it carefully with plenty of heatshrink tubing and rubbery electrical tape. Seems like it basically disables overdrive and maybe modifies some shift points. Not a big win, since I don't tow or haul, but it's one more thing working. Along the way I learned how to take off the dash bezel... and somehow accidently pressed down the parking brake and snapped a brake cable along the left frame rail. I'm reading that the parking brake is ineffective at best, so I guess that's that. Does anyone know what ballpark should be for a 1500 0-60 time? I know it will change a little bit based on dif ratios and all that, just a ballpark? Don't go spending time, just if you know one off the top of your head. I started driving in the mid-to-late '70's when 0-60 in under 10 seconds was a sports car. In '75 a Corvette had 165 hp. About the same time the "hot" Mustang had 140. I drove cars that had a hard time accelerating uphill. So my Avalanche seems pretty darned fast to me! Horsepower figure show up many times at the top of the rpm range where most of us don't drive unless we are racing. Torque gets us off the line at lower operating rpms and is more important on a large/heavy AV in everyday driving. Horsepower determines how fast you hit the wall, torque determines how far through the wall you go. So that thread says 8.3 seconds on a 2WD like my Z66. Stock 4WD will be slower. I have a CAI, Custom HP Tune, and Magnaflow high performance exhaust and Dynatech Long Tube Headers, 8.3 seconds seems a bit slow.